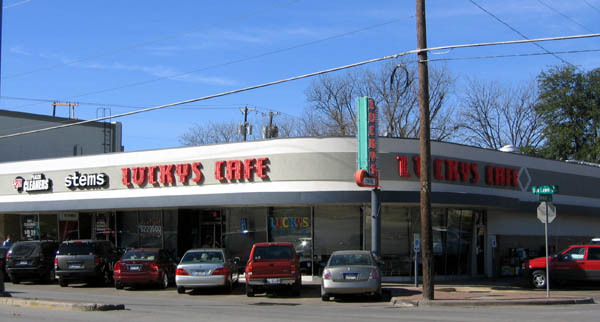 Lucky’s Café is nothing short of a historical landmark for the gay neighborhood in Dallas. It is an institution that has seen stood against time and AIDS and still continues to serve some of the best home cooked diner food anywhere in the city. One only has to look up to see the history. Above the full-length windows that curve the perimeter of the restaurant, the walls are adorned with graffiti, words of prayers, and good-byes to all of those friends and loved ones that were lost to AIDS. Lucky’s Café is a place to dine with friends, families, loved ones, and of course strangers and those you just spent the previous night with. It’s a place where everyone is welcome, and everyone who has ever been a part of this neighborhood has spent many of wonderful hours. The food isn’t fancy. It isn’t plated for a photographic spread in Food and Wine Magazine. It’s just damn good. From Chicken Fried Chicken, to Grilled Meatloaf, from twenty southern vegetables to choose from to salads, soups, burgers and sandwiches, there is always something to satisfy every taste. The service is among the best in the area because many of these men and women have been serving the gay community for thirty to forty years. Even if it’s your first time, they will treat you like you’ve been friends since childhood. Seriously, if you are ever in Dallas for a day or a week, Lucky’s Café is the place to go. You’ll get great food, become an immediate member of their family, and leave feeling good about supporting and being a part of this historical landmark.